I’m doing something different this year: I’m not planning/making/stressing over a Thanksgiving feast. Nope. No, sir, not this year. I’ve decided to make it a take out sort of night. Just good, non-homemade food and time spent with family (mom, gran, bf). That’s it. No recipes. No shopping. No cooking. No cleaning. Just time to kick back, watch some films, and veg out. Being on the Whole30 during the holidays is supposed to be next to impossible, but I’ve actually realized that I’m not really missing any of the stuff I would traditionally gorge on. Growing up Cuban, the foods associated with Thanksgiving were not really on the menu, so I have little nostalgia towards things like pies and casseroles. I only discovered pumpkin pie as an adult, and I prefer my own to anyone else’s, so I can make it any time I really crave it. As I write this, my coworkers are arriving with all manner of dishes for our holiday feast, and I know that I will only pick out those sides that I enjoy and which are compliant. I won’t feel deprived, nor will I feel deprived when we’re chowing on friscase or picaddillo on Thanksgiving. Sometimes, not following tradition is the best tradition. Woke up to the usual chorus of meows and meeps… feed me, feed me. Never any rest with the kitty cats. Don’t be misled by the sad look… he is a total opportunist. Fed the kitties (cat 2 is too skittish for snapshots), then fed the self. I’ve been making more of an effort on my presentation, even if no one else is joining me. Gives me a bit of a perk me up. I only take a few supplements, but I started taking turmeric a little over a month ago (this is my second bottle) and I’ve really noticed a difference in my TMJ. The number of morning headaches is definitely down. Also, started taking biotin again. I take it on and off, but my hair was in need of a boost. A little tea for the lady business… turns out the tiredness was mostly PMS. I take these teas every month and find I don’t need to take as much advil to relieve the aches. Then there was second breakfast, because first breakfast just wasn’t cutting it. Happens. In honor of self-care Sunday, the boy treated me to a foot massage! I told my friends about this place and they thought I was mad but it is AMAZING! They do an all over massage with a focus on reflexology. I feel totally melty. Brace yourselves! Horror movie stuff right here! I bought a couple of paper masks a few weeks ago and decided to top off my post-massage vibe with a little pampering at home. Plus, turbie twist FTW! Time for a demitasse and catching up on the blogs. TTFN! Had to play hostess today during one of our library events and got to exercise some of my event planner type skills. The event centered on a visit from the Deputy Consul from Argentina, so I had to develop an Argentinean theme for the treats to be served. Some quick research and trips to various stores and Hispanic shops turned up the perfect mix of quick, affordable bites. Went with a blue and white theme for the tableware to coordinate with Argentina’s flag. Martin Fierros – Manchego cheese (I used sharp white cheddar to stay within our library event budget) and quince jelly. Similar to the Cuban timba (white cheese and guava paste). A tasty, sweet and savory mix. 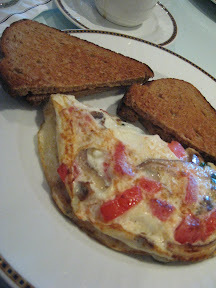 Last night, I watched PBS’s “A Breakfast Special” and it got me thinking about the most memorable breakfasts I’ve had. I LOVE breakfast, but I don’t really have a proper, full breakfast very often. My breakfasts typically involve a small bowl of almond milk and cereal with a side of jammy toast. Usually, full breakfasts are tied to special occasions in my home—birthdays and holidays, but especially my mom’s special Christmas breakfast with the works. Sometimes I’ll bake something up for breakfast and serve it with coffee. For the most part, I stick to the same tried and true breakfast/brunch places. These include South Miami’s Sunset Tavern & Deli Lane, where they have some of the best grits I’ve ever had and the ever delectable “Challah Egg Melt”. It’s a understated, relaxing place to have a fresh-air brunch on a Sunday. John Martin’s is another favorite, lots of fond birthday and lazy Sunday memories there. They make a great full Irish breakfast, and a mean Eggs Benedict and French toast croissant. 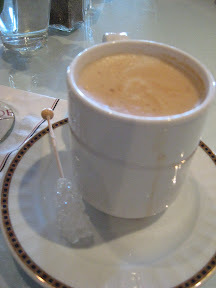 Then there’s the Indigo at the Riverside Hotel in Ft. Lauderdale, where the brunch menu always changes and they bring your latte with a swizzle stick. I also have some great memories of croissants at the Vie de France Bakery on Main Street in Miami Lakes, short stacks at the IHOP by the airport, and pancakes at the now dearly departed Joffrey’s. Most of these memories are associated with good company as much as great food… I think a great breakfast companion can make an Egg McMuffin seem like the most memorable breakfast. The last “best” breakfast I had was a short stack and eggs at the Original Pancake House in Doral on a lazy Saturday after an unsuccessful antiquing trip to the flea market. Delicious. When weekends are slow at the library, I become a random researcher. Meaning, I start to look up random subjects and browse through sites to learn more. I was looking up information on local farmer’s markets and one site led to another, until at ended up on the Get Kids In Action site. Mind you, I don’t have kids or small siblings/cousins in my family, but my mom works with kids and I have become increasingly aware of how awful school nutrition really is. After going through my own issues with health and weight, I have become something of an advocate for healthful living and eating. I don’t make much of a fuss about it online, but I know I drive my b-chan nuts sometimes when I go on one of my food rants. I’m not a dieter, I’m just very aware of what I eat. I have healthy breakfasts, pack my lunches, and prepare my dinner at home. My family rarely bought prepared foods or ate out when I was a kid, aside from the occasional celebratory dinner on birthdays or holidays… and even then, we often just made something special at home. On average, I eat out 3 or 4 times a month, usually because my b-chan asks me out for dinner or because I’m in the mood for something I don’t know how to make (like sushi). However, despite my generally healthy eating habits, I was fat. I developed a thyroid condition when I was a tween, but I think much of my weight gain was exacerbated by the food I ate at school. My mom, well-meaning though she was, didn’t know any better and believed I would get the nutrition I needed from school food. Frankly, I didn’t know any better either. I had free lunches from the school cafeteria all during elementary and middle school. Looking back on it, I know that things like pizza, chicken nuggets, and mystery burgers accompanied by chocolate milk and whatever manner of carb-based side was on offer were not the best options for a growing child. Then came high school and the glories of high fat, high sugar options. I was no longer eligible for free lunch, but that was ok, my school had choices. Burgers from McDonald’s and Checker’s, slices from Papa Johns and Pizza Hut, sandwiches from Subway, chicken and biscuit boxes from KFC, and lattes from Starbucks, along with a variety of snack items, vending machines, soda machines, and whatever sugary treat the football team and/or band was selling for funds. There were no fries to be had, but I am certain I was eating well beyond the daily calorie and fat allowances for a 14-17 year old girl as it was, never mind all the added sugar. Is it any wonder that I gained weight? Good nutrition starts at home, but I think the school nutrition boards have a lot to answer for as well. My mom works at the elementary school that I attended and every so often she brings home snacks that are leftover from the aftercare program. These are given to the students after they are picked up from their classes at the end of the day, before they are taken to their aftercare classes. In the last year, the quality of the snacks has changed. Some effort has been made to introduce more healthful snacks, but some of these efforts are still somewhat misguided. One of the snacks that always make me laugh are the Super Donuts, cinnamon cake donuts made with whole wheat. Whole wheat they may be, but a donut is still a donut. I’ve tried them, they taste alright, and my dad has certainly felt the effects of the Super Wheat blend, but teaching kids that eating donuts on a regular basis is not the right way to teach healthy habits. And that’s the rub. I like to indulge as much as the next person. I have my guilty pleasures (dark chocolate, ice cream, a properly prepared mocha latte, pumpkin anything), but these are occasional treats enjoyed in moderation. By giving kids things like wheat-based cakes (they have these too), donuts, high sugar cereals, and mostly gelatin-based yogurts, you are not teaching them to eat well, you are giving them mixed signals about what healthy eating really is. Yogurt is healthy; yogurt that lists gelatin, sugar, and an array of artificial flavors as the main ingredients… not so much. So, yes, healthful habits should start at home, but the lesson should be reflected at school. Schools should not undermine parents efforts, but support them. And now I shall step down from my soap-box. In an effort to waste-not want-not, I’ve been trying to get creative with leftovers. Tonight’s experiment: The Littlest Macaroni Bake. And it really was little, baked in a very small glass baking dish, but quite hearty. I had some of my grandma’s picadillo (Spanish-style ground beef… well, Cuban-style in this case) left over from Sunday night’s dinner, so I thought I’d give it a try. I don’t eat much meat anymore, but I’m a bit of a flexitarian, so I will have the occasional beefy meal. After last week’s of tofu-based meals, and several days worth of soup and toast, this was a nice change. I boiled up half a cup of macaroni, then mixed it with about 1/4 cup tomato & basil pasta sauce, the picadillo, and a few pieces of chopped mozarrella (er… string cheese, it was all I had in the fridge but it served its purpose) and tomato. Then I baked it at 300 for about 30 minutes–the dish was so small, I didn’t want to burn it. Overall, a nice, quick meal and enough to share with mum and gran. I asked my b-chan if he would like to have something different for Friday dinner, (I’ve been trying to save money by eating in and I like having control over what goes into my meals) and he suggested lasagna. I’ve watched my mom make lasagna countless times and I love the result, but I had never attempted to make on myself, so I took this as a sort of personal cooking challenge. I wanted to not just make my first lasagna, I wanted it to be a recipe of my own devising. Based on the different lasagnas I have tried in the past, I picked my favorite ingredients and a few of my own choosing—flavors that I felt would go well together and enhance the simplicity of the usual layers. I also wanted it to be “lighter” than the ones I’ve tried in the past. Obviously, a dish that comes in layers will never be light, but I tried to balance it a bit. I also wanted to make it smaller than the giant 9” x 13” casserole that my mom usually makes, so I used an 8” x 8” dish so that it could be divided into 9 modest portions (enough for seconds for four people). I reduced some of the fat content by using lean ground beef and fat free Ricotta cheese (ground turkey or chicken can be substituted for lighter options, but I was serving a meat-loving crowd). I wrote the steps down as I prepared the meal, but the measurements are approximations as I usually combine ingredients based on visual measurements (meaning I just toss things in according to my own taste). I’m not as brave with baking—I don’t want to end up with gigantic cookies or flat cake—but I feel more experimental with meals. Continue reading for the recipe and images. One of the more interesting (unusual?) aspects of living in the city that shall remain nameless are the fruit vendors that you encounter on street corners and parading down busy streets during the rush hour gridlock. It’s not actually a Miami-wide phenomenon; I have actually had friends from other parts of Miami drive by and wonder at the sight of a fruit/flower/churro/peanut vendor walking past their car. It’s a different form of local industry–not quite a farmer’s market, but close enough. Usually, you find lemons and oranges from $1-5 a bag, maybe some avocadoes. But come summertime, it’s watermelon season! And these are usually the best watermelons, sold off the back of some pickup on the side of the road. Unlike the dry, whitish, over-priced melons at the local grocery chain, these tend to be fresh and juicy, and probably from the local farms in the Redlands. I’m fairly broke at the moment, so I decided to treat my mom and gran to a home-cooked dinner rather than take them out to eat. I’m in for a long day of cooking, having started with dessert early this morning and some fresh breakfast treats for tomorrow. Dinner is still a few hours away, so I’m taking a break 🙂 . I started the day by making Mostaciolli, an Italian chocolate spice cookie that I found on Delish. The picture reminded me of the German spice cookies that my mom’s cousin sends us every Christmas, so I thought it’d be a treat to make these. The cookies wer easy to make, but the steps involved are very specific. It’s one of those recipes that you really have to read beforehand if you’re going to mix things properly. The dough also gets very thick and dense, so it can be a bit difficult if you don’t have a powerful mixer (and I do not have a powerful mixer, which is why I now owe my mom a new one 😳 ). The cookies smell lovely, though I replaced cloves with nutmeg as my mom does not like the taste of cloves, and they look wonderfully chocolatey–like bonbons. I also decided to take a risk and try my hand at making english muffins based on a recipe that I found on Annie’s Eats. Annie’s recipes tend to be very easy to follow and always turn out great, so I took a chance and finally got to use that Whole Wheat flour that I bought by mistake during the last baking extravaganza (re: Christmas baked gift giving week). Again, the steps are the most involved part of this recipe… unless you don’t have that mixer… I ended up hand kneading these, but they still managed to turn out as they should. It’s no wonder Hispanics are notorious for bad health when you consider the kind of stuff that we eat. As a culture, we’re known for food that is loaded with fat and carbs – everything can be fried after all, but whatever is not fried is heavily laced with sugar. Sweet and oily that’s how we roll. It took me years to get my very Cuban grannie to stop frying everything, to get her away from the grease kettle thing that she loved to overuse, and to get her to stop adding sugar to milk. I started complaining about the way we ate when I was a kid, but who was going to listen to a 10-year-old’s nutrition advice? It was around the time that I was in middle school that I finally started to see some change happening–my grandmother started cutting down on the maduros and reduced the amount of oil she used to cook. Though we had reduced our salt intake around the time that my mom was diagnosed with hypertension (around ’93), it wasn’t until she was diagnosed with diabetes and my grandmother’s cholesterol became a problem that I finally saw them taking their diet seriously. For the last few years, brown rice has replaced white, olive oil has replaced corn and used sparingly, more vegetables have been introduced, as well as leaner meats. I tend to cook for myself because of my work schedule, so I have more control over what I eat. It’s been a slow process, but we’ve all learned to eat better. So what got me to think about this today? I’ve been trying to control my weekend eating with the BF (and yes, I know you might be reading this). But what really got me started was my trip to the grocery store this morning. I was picking up some flour for the Mother’s Day meal that I’m going to prepare on Sunday when I came across a package of Panela. This stuff is a “new” discovery for me. I say “new” because I’ve been aware of the little round blocks of hardened brown sugar, but it’s not something that Cubans eat, so I never really paid much attention to it. I became aware of this stuff recently, as the BF’s grannie mentions it often. At first, I thought that there was something more to it, but Panela is just hard unrefined sugar. The one I saw at the store today read “100% brown cane sugar” on the ingredients list. It’s just brown sugar. It has no nutritive value whatsoever. Aguapanela is made by melting fragments of panela in water and stirring until the fragments are entirely dissolved. The drink may be served hot or cold, with lemon or lime often being added. In the hot form, sometimes milk or a chunk of cheese is added in place of fruit juice. Aguapanela is the traditional drink served with many dishes in the colombian cuisine, especially in the paisa region, such as to accompany the bandeja paisa and the sancocho soup, and it is often also served alone as a thirst quencher. Many claims have been made about the beneficial effects of aguapanela, based on beliefs such as having more vitamin C than orange juice or as many rehydrating minerals as Gatorade. Popular belief also considers it a helpful drink for the treatment of colds. Since panela is a relatively cheap, locally produced food, most of the poor people in Colombia, especially the peasants, obtain the majority of their caloric intake from it. In many cases panela and small amounts of rice and plantain are the only foods available, due to the scarcity and high prices of other products rich in proteins, such as meat and milk. I can understand now why she believes this is a valuable nutrient; however, it’s just as bad as my grandmother’s obsession with adding milk to sugar — she too thought this was good for me when I was a kid. I have to admit, I’m a little fascinated by the cultural aspects and associations of certain foods.